Car maintenance. It’s basic stuff, but many people get it wrong. Experts recommend getting your car checked out by a professional about once a year. This should be an individual who can hoist your iron steed on a lift and inspect the suspension, brakes and other systems.There are, however, many things that you can and should do yourself, to have a car that runs efficiently and well even between doctor’s appointments. Keep a checklist and turn regular examinations into a habit, and you will be a happier driver. First, the monthly cycle. There are certain things that you are well advised to check on every thirty days, and those include oil levels, tire pressure, and coolant/antifreeze levels. When checking liquid levels (and really, any time you need to go under the hood), let the car engine cool off for about 30 minutes. Many of the systems in your car are under pressure, and opening a cap too soon can put you face to face with a hot geyser. Checking coolant levels in new cars is easy – they usually have a reservoir with markings on the side, and all you need to do is look under the hood. With cars made in the 1970s and earlier, you may need to open the radiator cap and check the levels with a rod. Keeping oil levels optimal is crucial, and must be done at least once a month (some guides even recommend twice a month). Everybody knows how to do it – just pull out the dip-stick from the engine block, check the oil level, wipe the stick and replace it. However, as we have blogged before, many people don’t know how frequently their oil needs to be changed. American drivers have been drilled with the 3,000-mile oil change, but experts today say that for modern cars with newer engines, this is excessive and wasteful. While the exact distance depends on road conditions, traffic and the driver’s personal style, a late-model car can go an average of 7,500 miles between oil changes. As for tire pressure, it’s one of the great unacknowledged drains on fuel efficiency. A car with under-inflated tires needs more energy to move, and millions of gallons of gas are wasted every year due to careless drivers who let their tires go soft. You really should own a tire gauge, and check the pressure of your tires at least once a month. Most gas stations operate free air pumps, so there’s really no excuse to run on half-flats. In our next article, we will go over a list of things you should check every three months. Had it with your car? 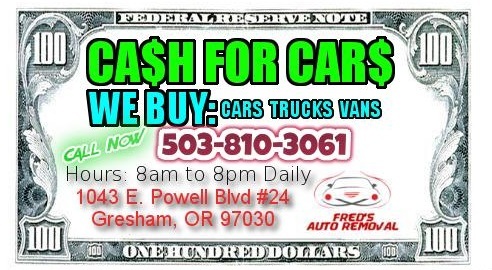 Contact Fred's Auto Removal and get cash for your car in Portland, OR. Chevrolet Cars Houston - Westside Chevrolet is a Chevy Dealer selling new and used Chevrolet cars, SUVs trucks, chevy automobile parts as well as financing, sales & service online in Houston, Sugar Land, Stafford, Katy, and almost all major areas in Houston, Texas. Kia Cars Houston - Westside Kia Dealership is a Kia dealer located in Houston, Texas serving customers in Houston, Katy, Sugar Land, Stafford, Texas. We offer new and used Kia cars, SUVs, Minivans, automobile parts as well as financing, sales & service online in Houston, Texas. To get FREE RV transportation quotes, start by filling out a free quote request.